German explorer; born at Oppeln, Prussian Silesia, March 28, 1840; killed at Kinena Station, Kongo Free State, Oct. 23 or 24, 1892. When he was only two years old his parents moved to Neisse, where in 1846 the boy was baptized into the Protestant Church. After finishing his studies at the Neisse gymnasium, he studied medicine at Breslau, Königsberg, and Berlin, passing the M.D. examination in 1864. From childhood it was his ambition to travel. This desire had such a strong hold on him that he left the university in 1864 before passing his state examination, and went to England, then to Italy, and finally to Turkey. In 1865 he was appointed quarantine medical officer at Antivari near Constantinople, which position he held for four years. 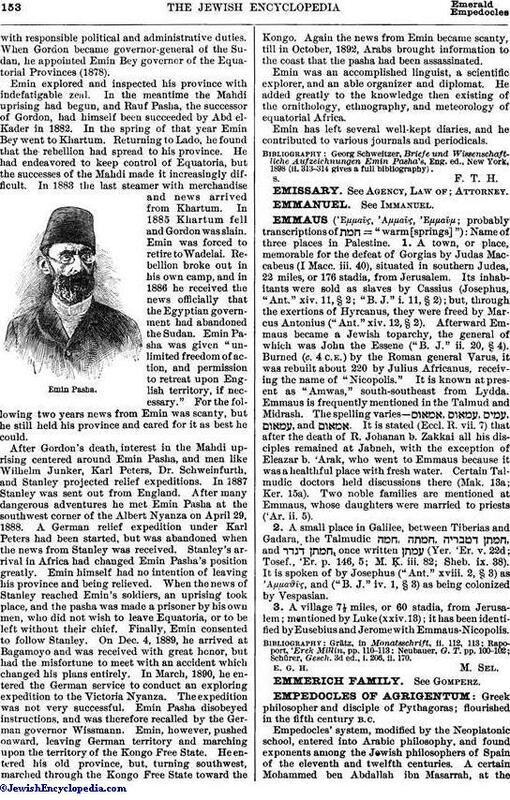 In 1870 he became physician to Hakki Ismail Pasha, after whose death he paid (1874) a brief visit to his home, and, traveling through Germany, Austria, and Italy, went to Egypt. He arrived in Khartum Dec. 3, 1875, joined Gordon Pasha, then governor of the Equatorial Provinces, at Lado, became his physician, taking the name of "Emin," and was often entrustedwith responsible political and administrative duties. When Gordon became governor-general of the Sudan, he appointed Emin Bey governor of the Equatorial Provinces (1878). Emin explored and inspected his province with indefatigable zeal. In the meantime the Mahdi uprising had begun, and Rauf Pasha, the successor of Gordon, had himself been succeeded by Abd el-Kader in 1882. 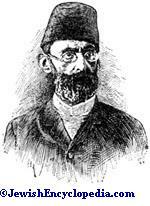 In the spring of that year Emin Bey went to Khartum. Returning to Lado, he found that the rebellion had spread to his province. He had endeavored to keep control of Equatoria, but the successes of the Mahdi made it increasingly difficult. In 1883 the last steamer with merchandise and news arrived from Khartum. In 1885 Khartum fell and Gordon was slain. Emin was forced to retire to Wadelai. Rebellion broke out in his own camp, and in 1886 he received the news officially that the Egyptian government had abandoned the Sudan. Emin Pasha was given "unlimited freedom of action, and permission to retreat upon English territory, if necessary." For the following two years news from Emin was scanty, but he still held his province and cared for it as best he could. After Gordon's death, interest in the Mahdi uprising centered around Emin Pasha, and men like Wilhelm Junker, Karl Peters, Dr. Schweinfurth, and Stanley projected relief expeditions. In 1887 Stanley was sent out from England. After many dangerous adventures he met Emin Pasha at the southwest corner of the Albert Nyanza on April 29, 1888. A German relief expedition under Karl Peters had been started, but was abandoned when the news from Stanley was received. Stanley's arrival in Africa had changed Emin Pasha's position greatly. Emin himself had no intention of leaving his province and being relieved. When the news of Stanley reached Emin's soldiers, an uprising took place, and the pasha was made a prisoner by his own men, who did not wish to leave Equatoria, or to be left without their chief. Finally, Emin consented to follow Stanley. On Dec. 4, 1889, he arrived at Bagamoyo and was received with great honor, but had the misfortune to meet with an accident which changed his plans entirely. In March, 1890, he entered the German service to conduct an exploring expedition to the Victoria Nyanza. The expedition was not very successful. Emin Pasha disobeyed instructions, and was therefore recalled by the German governor Wissmann. Emin, however, pushed onward, leaving German territory and marching upon the territory of the Kongo Free State. He entered his old province, but, turning southwest, marched through the Kongo Free State toward the Kongo. 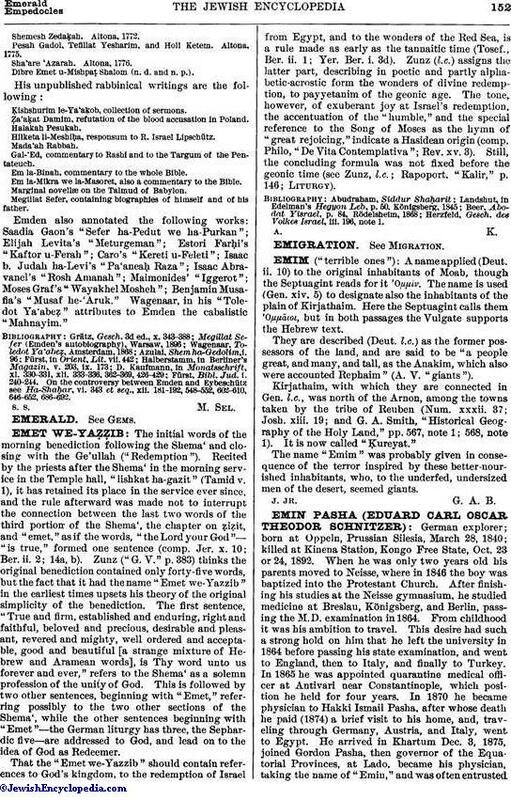 Again the news from Emin became scanty, till in October, 1892, Arabs brought information to the coast that the pasha had been assassinated. Emin was an accomplished linguist, a scientific explorer, and an able organizer and diplomat. He added greatly to the knowledge then existing of the ornithology, ethnography, and meteorology of equatorial Africa. Emin has left several well-kept diaries, and he contributed to various journals and periodicals. Georg Schweitzer, Briefe und Wissenschaftliche Aufzeichnungen Emin Pasha's, Eng. ed., New York, 1898 (ii. 313-314 gives a full bibliography).